Is it really that simple to save money using Ebates? Yes, yes it is. I also just love their slogan “Where It Pays To Shop Online“. Even if you shop only once and awhile online, this money adds up and its super easy. Who doesn’t like having more of the almighty dollar? So, please continue to read my, A Ebates Review to start using and understanding this powerful money-saving site. You won’t regret using it. If you enjoy shopping online and you’re not already taking advantage of using Ebates online shopping tool, you are throwing money down the shitter. Yep, the shitter, but all is not lost, because…you are going to be currently learning about an essential website and app to help stop your wallet from bleeding money, which will make you a wealthier and happier person in the long run. With savings up to 40% you can’t go wrong. Yes!!!! It’s one of the simplest ways to save money online. It easy to join, just click Join Ebates enter your email address or sign in through Facebook or Google+. Some people think it’s too good to be true, and are hesitant about joining. Ebates delivers and is completely scam free. So no worries. You don’t have to worry about learning some new complicated point system or gimmicky structured system, that would need a mathematician to understand truly. It simple and automatic. It works!!!!! There are literally thousands of people that posted the checks they received from Ebates, either through pictures or videos. So rest assured you will be paid. Ebates is not a scam. Just keep in mind the payments are quarterly and not exactly fast or instant gratification, but also it gives you time to build up your online savings to make a healthy payment to you. I once waited for six months on an actual rebate that I had to mail in, so Ebates is faster in most cases. 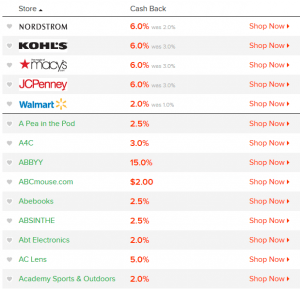 Ebates store list is just continuing to grow year after year. With over 2,000 stores in which to potentially save money. With all the well-known department stores and obscure unheard of stores as well, so before you purchase anything online, you should be logging on to Ebates to see if you can save some money. Even Amazon is on the list. Yes, it is available in China, Canada, Korea and Singapore. Also, Yes, as long as the store you are purchasing from will ship outside of the U.S. and Canada. All cash back payments are made in the available currency(ies) of your selected payment method. Yes, Ebates is available in Canada. The average shopper typically makes about $10.00 a month, more or less. No forms to fill out, no gimmicks, no points to redeem, just cash back! It’s all automatic, every quarter your money is sent to you automatically. I like this! Payment is by check or PayPal, and I love PayPal so a great feature. The check is called Big Fat Check, like that. No mail-in rebate forms to send thru the USPS. No strings attached. Nice! They have the Ebates Button, which is awesome and a must have for any of these browser Firefox, Chrome, and Safari. It rated 5 stars from users. This makes saving easy. Available as an app on your smartphone. An excellent solid affiliate program. You can easily make money just referring your friends. Yeah, try $5.00 per friend. If you would like to support my site, you can sign up here to be my referral here. You get advanced notice on sales, free shipping coupons and more with the Ebates Button installed on your computer. Ebates is the online leader and pioneer in savings and cash back money online. People are skeptical at first, they are quickly won over once they use Ebates. Sometimes during certain times of the year, Ebates runs a Double Cash Back Deal where they basically double the amount of cash back. Keep an eye out. Payments are sent out quarterly, so it not instant, but on the positive side it allows it to build up over time so you receive a bigger payout. To receive a check or PayPal payment (Big Fat Payment), you must have a minimum balance of $5.01. Not that big of a negative but limits are limits. To save money you must spend money, but this is not a problem as people always need something and why not save when shopping anyways. You’re not going to get rich using Ebates. It’s not really its purpose to make you rich just save you some money. This is the most important tip on using Ebates. Download and install the Ebates Button. Why, because it just lays there in the weeds and does all the work for you when you need it to. Saving you time because there is no need to visit Ebates.com first. It alerts you when you can cash back is available to you at any of the participating stores. Sometimes it is even instant. It even applies coupons and promo codes automatically for even more savings. Don’t spend money just for the sake of you getting money back from Ebates. Only buy what you need otherwise you are defeating the purpose of using this app, to save money. When you receive your check, don’t forget to cash it, as with any check the expire at some time in the future. If your going to be doing home renovations, order you major purchases online for in-store pickup. You can save a bunch. Great for using on vacations too. Priceline for tickets and for eating out Groupon. For Hotel rooms too. BeFrugal – Is BeFrugal.com A Scam? Is my in-depth review of BeFrugal, a great way to save money while shopping online. Swagbucks – You can read more about here at my review Is Swagbucks Legit? and Earn Money From Home. Dealspotr – This is my new favorite site for saving and making money. 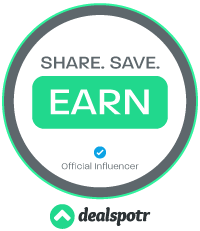 Join here or check out my reviews here: What Is Dealspotr About? and How To Become An Influencer At Dealspotr. Whether your rich or poor, who doesn’t enjoy getting a better price. Ebates is for everyone looking to save money, after all, you worked hard for that money. Now start protecting and saving it by using this site and app. 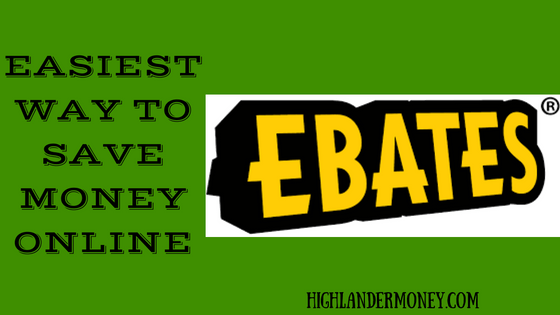 Ebates has an active blog which has many helpful tips and tricks as well as giveaways. Ebates has a Help button located at the bottom right-hand corner of your browser which you can always click on to try to get a question answered. Everything is relativity easy to find. Ebates is 100% free to use. In my A Ebates Review I highlight the many benefits, the two main benefits is saving money and ease of use. It free to sign up so there is nothing out of your pocket to start enjoying the many benefits of Ebates. Most people shop online more and more often, and with the Ebates button, it makes effectively using Ebates that much easier and you won’t forget to use the login to Ebates, to get your deals, its done automatically. Your getting paid for just installing the button and registering with Ebates and let’s not forget shopping as well. I feel very confident about giving Ebates a high rating of 9 because of its ease of use and the money-saving benefits of using this to shop online. Saving hundreds of millions of dollars for the consumers out there. If you are looking at working from your home and need a 100% legitimate way earning money, check out my #1 Recommended Way To Earn Money Online. As with any of my pages, I always welcome feedback or comments. I will do my best to answers the questions and help you. I love to save money. It seems that Ebates can help me do that very thing. You give a lot of detail with fun images that make the read smooth and interesting. I have heard of ebates, but never signed up due to no review. I am glad you took time to give the finer points of program. Thanks again for your money saving tips post. Hey Tim, Yeah if you love to save money, you should become good friends with Ebates, especially if you do a lot of shopping online. Glad you enjoyed reading it, I try to do my best and make it interesting. You should definetly sign up and start saving as soon as you can. I also highly recommend download the Ebates button makes it so easy. Thanks for the stopping by. Thanks! Spent a little time on it researching Ebates, as I hope this comes across.